Biggest strength in 2016: After suffering through an immense number of injuries in 2015, the end of season finally saw Frank Tavani’s offense sputter to life, thanks to the emergence of an effective running game. The emergence of RB DeSean Brown (877 all-purpose yards, 5 TDs) wasn’t enough to completely turn around the Leopards’ 1-10 campaign, but it did give Lafayette fans a bright spot for the offseason. 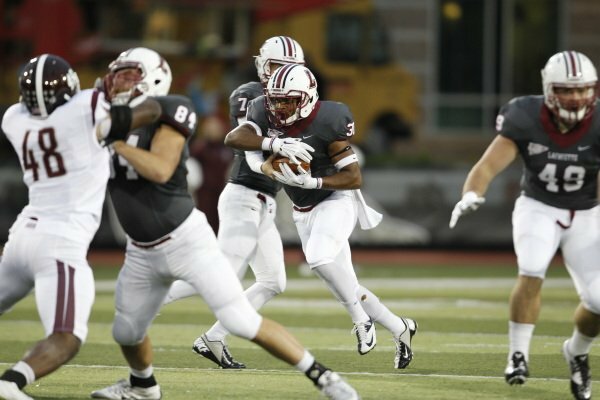 Biggest Challenge In 2016: Once the strength of Lafayette’s Patriot League championship teams, the Leopard defense gave up an average of 35 points per game, including giving up 49 to their hated arch-rivals Lehigh to end the season. An anemic pass rush (9 sacks in 2015) will undoubtedly be a big point of emphasis in the preseason, as will be preventing sacks (38 last season). Biggest Departures: CB Matt Smalley, whom few Leopard opponents dared to test through the passing game last season, graduated and finds himself on the New York Giants’ preseason roster. SS Jared Roberts, too, also graduates after finishing fourth on the Leopards in tackles last season. Players To Watch: Which version of QB Drew Reed will Leopard fans see this fall? As a freshman, Reed surprised many to emerge from nowhere to guide the Leopards to a stunning Patriot League title and appearance in the FCS playoffs. After an injury-riddled sophomore year and an inconsistent junior campaign, though, all eyes have to be on Reed to see if he can continue to build on the end of last season, where it looked like the Leopards were starting to turn things around a little. Biggest Game: at Central Connecticut State, 9/2/2016. In 2015, Lafayette faced off against William and Mary and Delaware in consecutive weeks, losing both games, and never seemed to shake off that smell of losing the entire season, except against struggling Wagner. In 2016, Lafayette still has a daunting schedule with games against Delaware, Villanova and FBS Army-West Point, but they open a season with a very winnable game against the Blue Devils up in New Britain, CT. A win there might be the springboard to a successful season; a loss might have Leopard fans see the same script unfolding as 2015. Lafayette In Two Sentences: Lafayette’s 1-10 season in 2015 was unexpected by pretty much anyone who has ever watched a Frank Tavani team in action. They have the talent to turn it around – if they can find some stability in the trenches and Reed returns to his freshman year form.